Stroll through charming, bustling neighborhoods and laugh with the locals while enjoying the 37th Street lights. Keep warm in front of a fireplace while sipping on cocktails and holiday brews on Rainey Street. Glide into holiday cheer with ice skating on the roof of the Whole Foods flagship store. Enjoy a delicious, winter season brunch or dinner complete with elegant, holiday decor at Austin&apos;s most historic hotel, The Driskill. Be inspired through dance at Ballet Austin&apos;s holiday performances of The Nutcracker. Sip distinctive holiday cocktails in the decorated Lobby Lounge bar at The Four Seasons. Walk through a 1.25-mile light show at Zilker Park&apos;s Trail of Lights. Grab your favorite holiday cookies, cakes and pies from The University of Texas area&apos;s most delectable bakery, Quack&apos;s.
Learn how to make traditional holiday dishes with cooking classes at Silver Whisk. Treat yourself to breakfast, brunch or even a late-night snack with Kerbey Lane&apos;s famous gingerbread pancakes. Twirl to twinkling lights on Austin&apos;s biggest ice rink at Holiday Lights & Ice at Omni Barton Creek Resort & Spa. 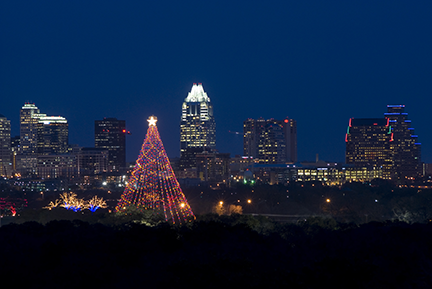 Warm up with hot cider and kettle corn from food stands beneath Zilker Park&apos;s 155-foot-tall Holiday Tree. Don&apos;t forget to look up as you spin in the middle for a light show that&apos;s sure to take you back to your childhood. For more fun Austin holiday events, check out our Holiday page, or tell us about your favorites at @VisitAustinTX or #TrueAustin. Contributed by Kristen Pankratz, ACVB Marketing Intern.